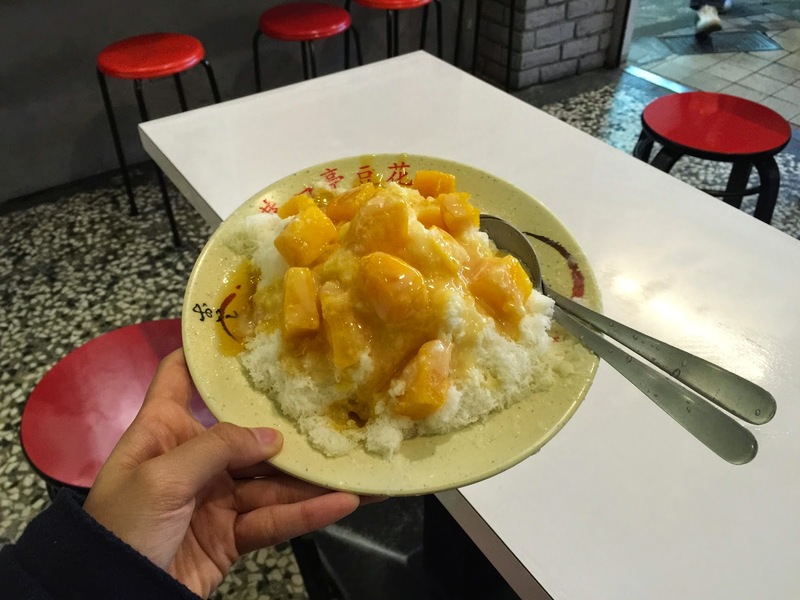 EUNICE ANNABEL: What to EAT in Taiwan! 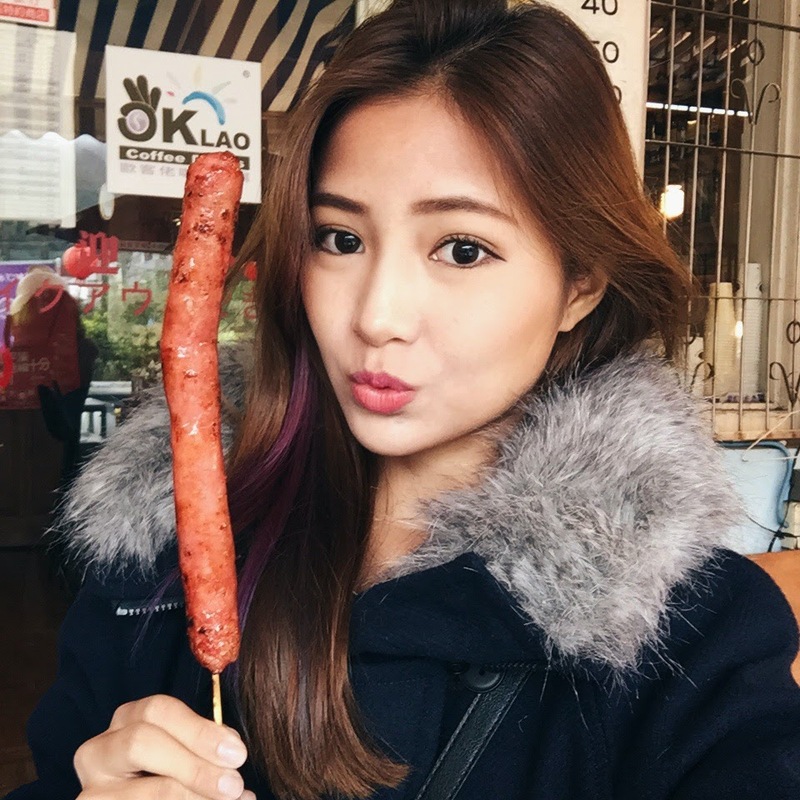 What to EAT in Taiwan! It's only been a few days since Fai and I came back from Taiwan and I'm already missing the food there. If you are following me on Instagram, you will be aware of how much street food we ate. Our entire vacation literally revolved around food! The first place we found some good food at was Ximending, which is just across the street from our boutique hotel (Just Sleep Hotel). Apparently, this place is known to be the Cineleisure of Taipei, where young adults and teenagers often hang out. It is also a shopping paradise where you can find exceptionally cheap apparels and accessories! A pair of knee high boots only costs about SGD$30. Alike Singapore, Taipei doesn't get really crowded until the sunsets. So before the locals come out to play, make sure you visit the following food stops or are prepared to wait in a long line. 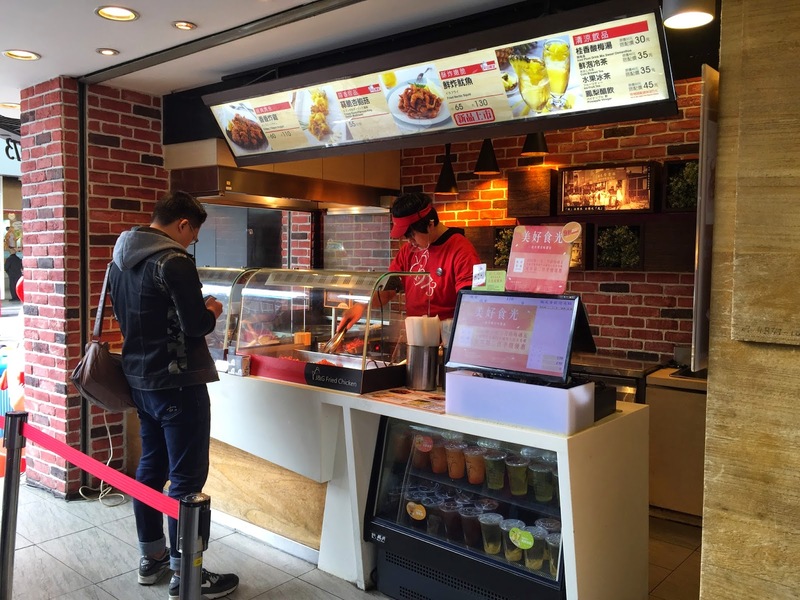 The first item to try is fried chicken from a store at the entrance of Ximending. I forgot to snap a picture of the store's signboard but you'll be able to find it for sure since there's always a really long queue. Fai and I only tried the first item on their menu so we don't know how everything else tasted. 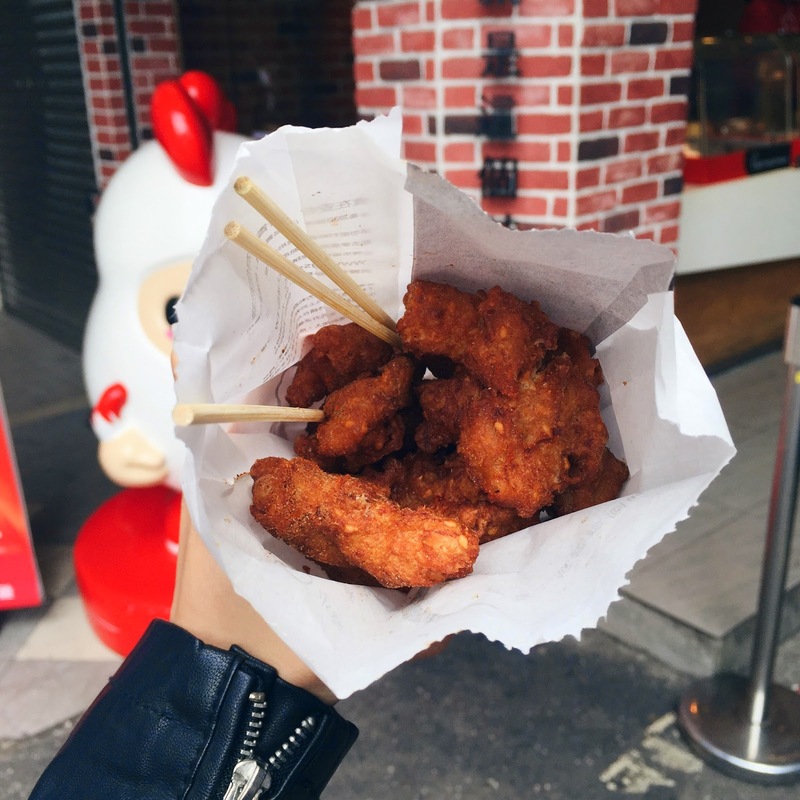 We ordered bite-sized pieces of fried chicken, which only costs about 40 to 50 Taiwan dollars for a small packet. That's only about SGD$2 or less!!! It was super flavourful and tender, totally worth the wait. Next, we ate the famous Ah Zhong Main Sian aka Mee Sua. It may be hard to find it for the first time especially if you can't read Mandarin but all you have to do is ask around for directions. 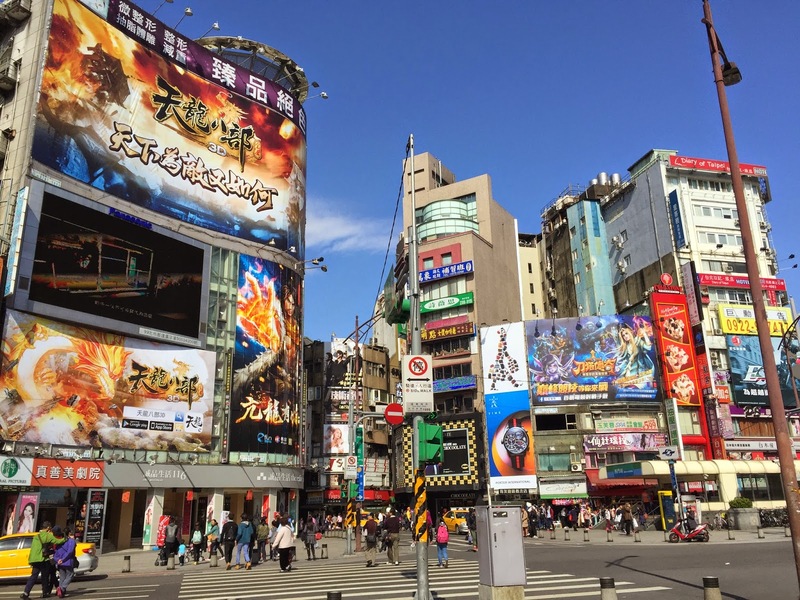 It's so popular; everyone in Ximending knows where it is. 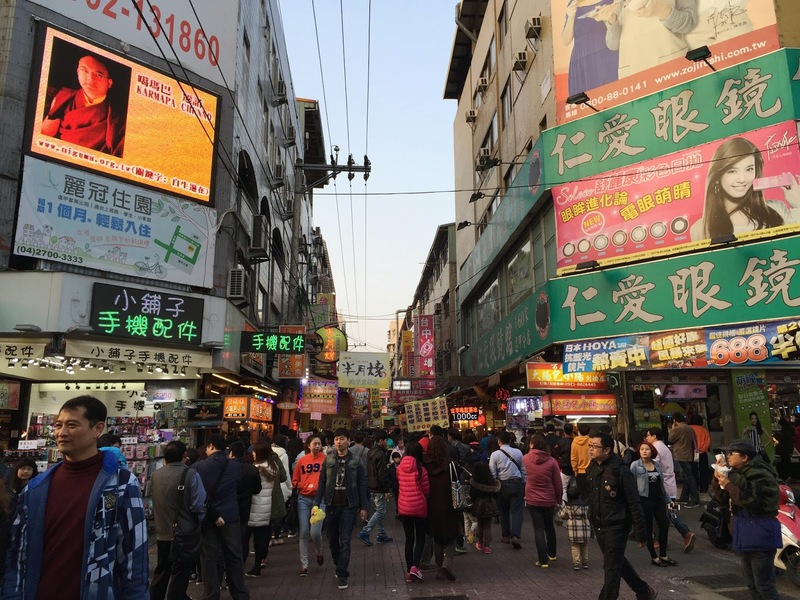 It's located towards the back of Ximending, away from the crowd. Perhaps there was something wrong with my taste buds that day or maybe we didn't add in enough chili sauce because I didn't find anything particularly special about the mee sua. However, Fai loved it! So maybe you will too. There was also a long queue so be prepared to wait in line. If you have a sweet tooth, listen up! 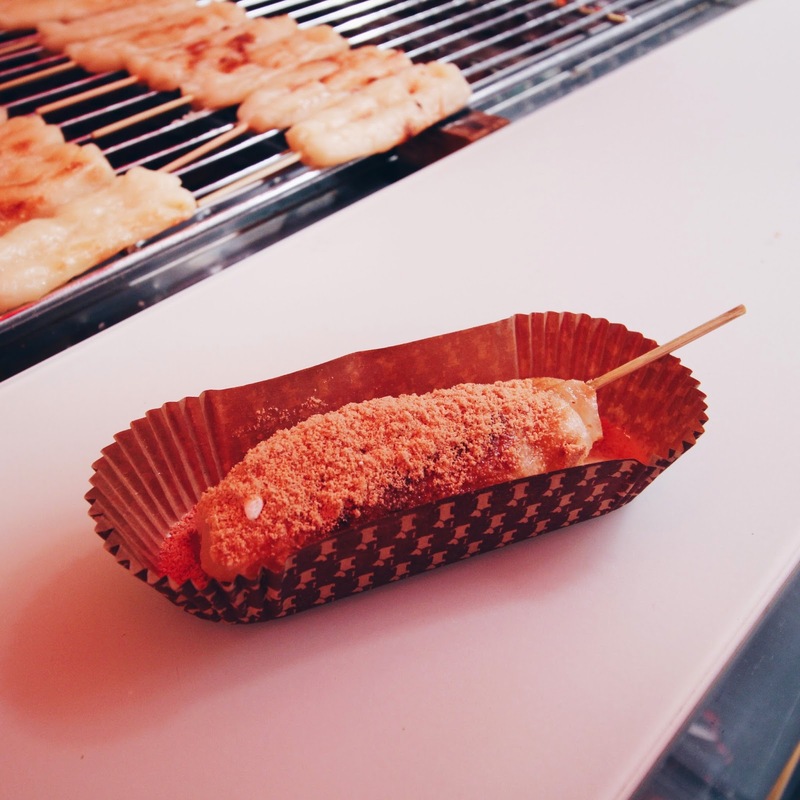 You're going to love this next street snack. Walk towards KFC and turn right, you'll be able to find Grilled Muah Chee. Yes folks, you heard that right. Think of our local pasar malam snack a lot warmer and crispier on the surface but still as soft and chewy on the inside. There is quite a huge variety of flavours to choose as well but Fai and I went for good old classic peanut and chocolate. Hot pot is quite a huge craze in Taiwan; you'd be able to find a hot pot restaurant every 5 meters in Ximending. We settled for one above Ah Zhong Mian Sian but we couldn't read the menu because it was written in full on traditional Chinese! So we got the waitress to just serve us the best. Turns out that she ordered a la carte dishes for us instead of hot pot dishes :( We were disappointed but the dishes tasted exceptionally good, there was nothing to complain about in the end. I especially loved the sweet and sour fish, and omelette egg with tang hoon. 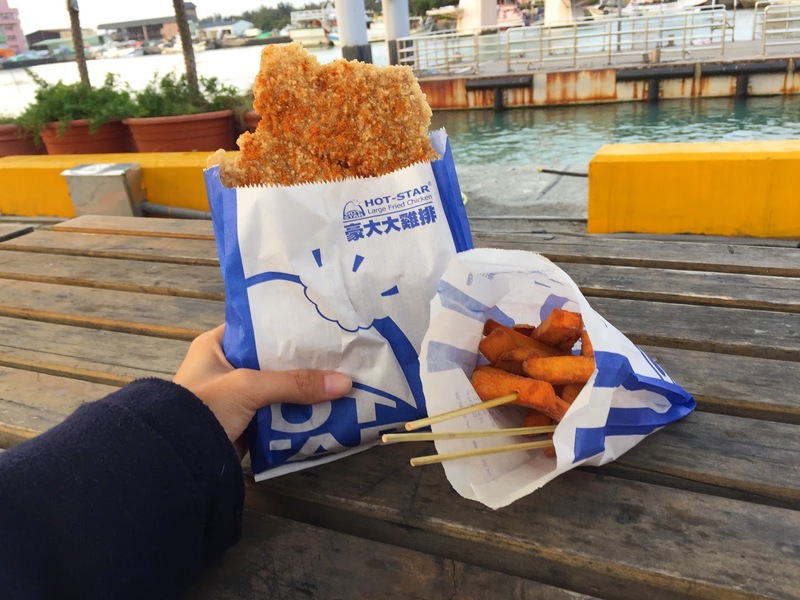 There's nothing to really eat or do at Tamsui Fisherman's Wharf but we did have really good fried chicken fillet and sweet potato there! Hot-Star Large Fried Chicken can be found in Singapore but it's costs about SGD$3-5 per piece? And it doesn't even taste that good here. However, in Taiwan, it costs less than SGD$2 for BOTH the chicken and sweet potato. So guys, eat as much as you can while you're in Taiwan because you're not going to be able to enjoy such delicacies at a fraction of the price here in Singapore. Tamsui Fisherman's Wharf is located nearest to Tamsui metro station, the red line. Red 26, 836, or 857. Ah! 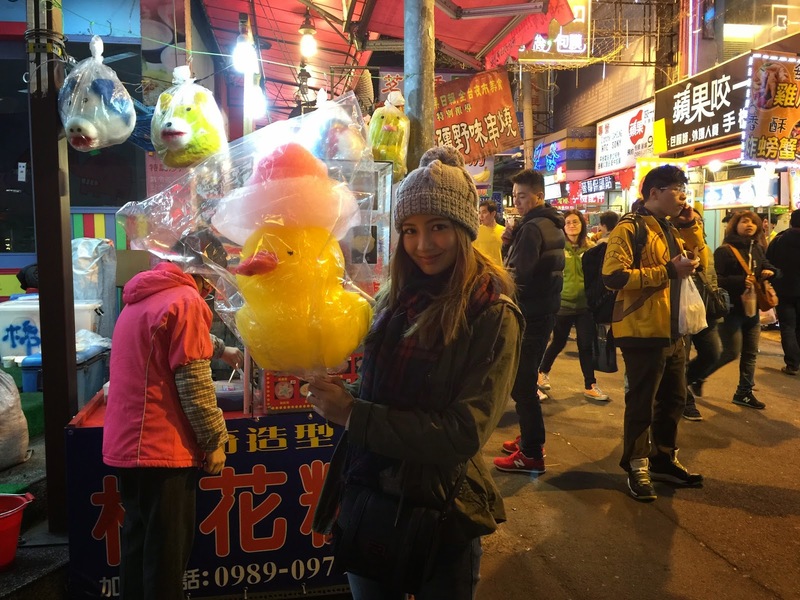 The ever-popular night market in Taipei! 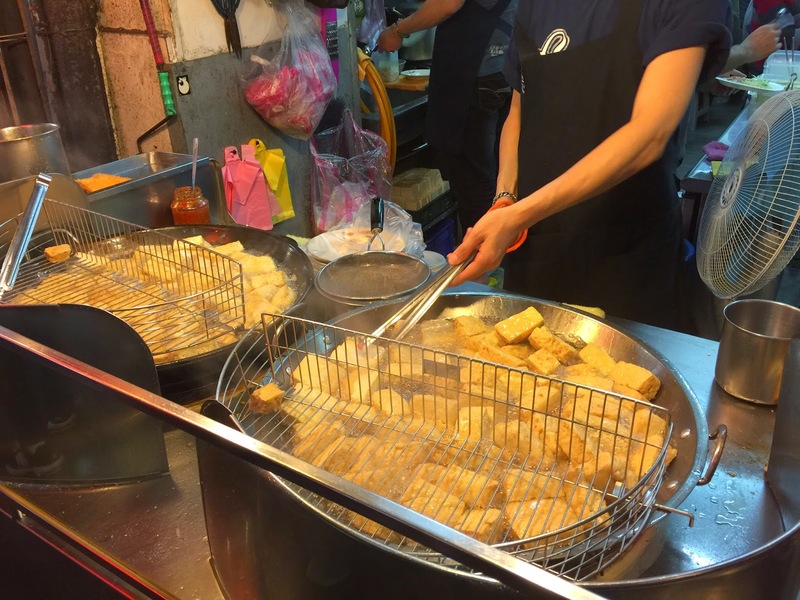 I guess Singaporeans have grown to natural think highly and expect a lot out of Shilin night market thanks to the "Shihlin Street Snacks" stores located all over Singapore. We've all probably already tried their large fried chicken fillet, oyster mee sua and more, but I'm afraid the real Shilin isn't as exciting as I thought it would be. The entire street was packed with tourists, it was so hard to move about or even stand still to purchase a snack. The food we had there weren't even as good as the snacks we've tried at other places and they were all a little over priced. Personally, it was pretty overrated. I only liked one or two snacks I had there. It's an awesome place to shop at though, I found quite a number of stores selling Stylenanda inspired apparels. 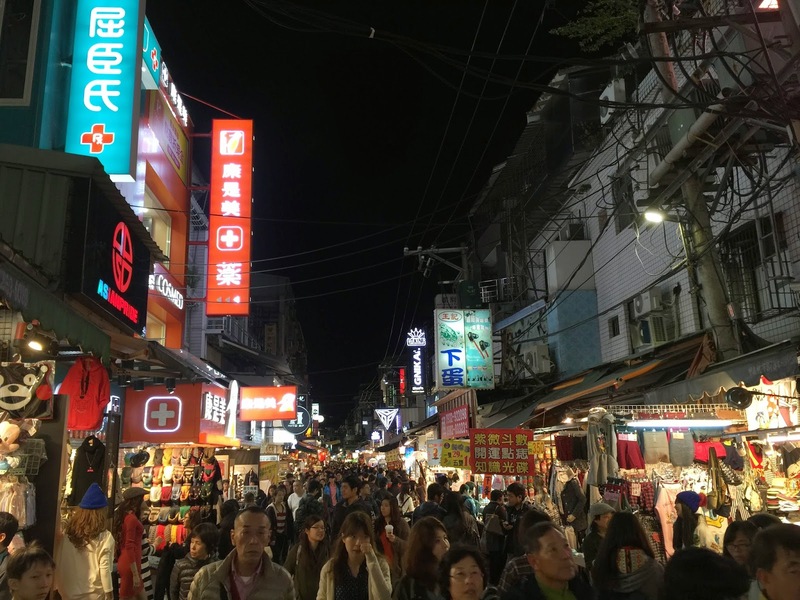 Shilin Night Market is located nearest to Jiandan Metro Station, on the red line. 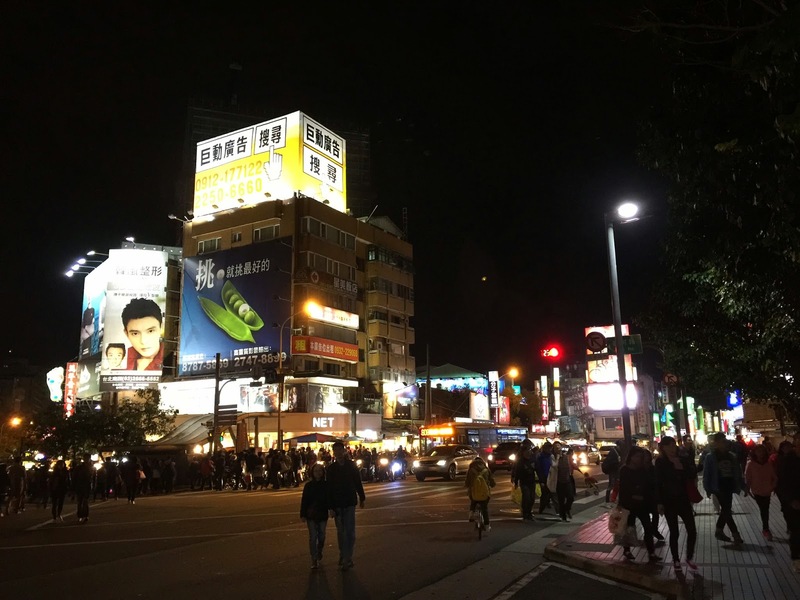 Be careful not to get off at Shilin station itself, the night market isn't located there. It's at Jiandan! The first item we tried was Da Chang Bao Xiao Chang. 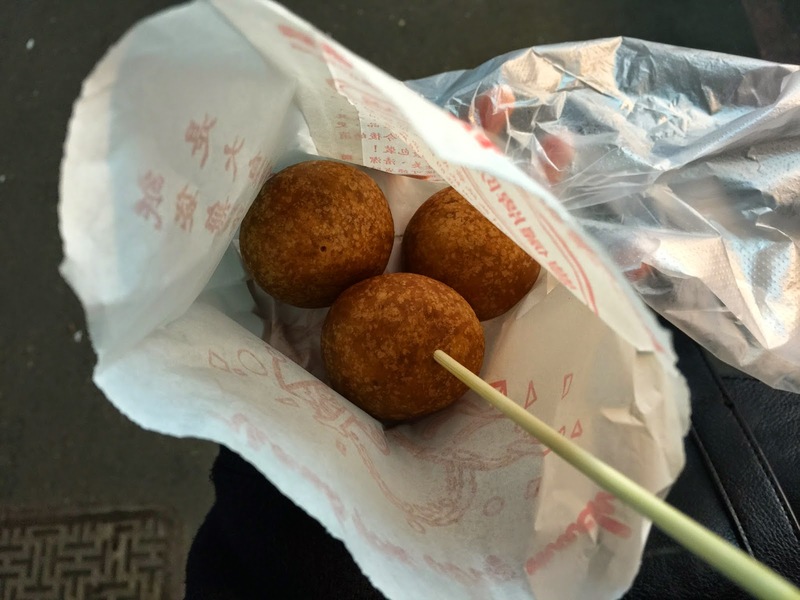 It is basically glutinous rice in the shape of a sausage wrapped around a smaller Taiwanese sausage. It's a huge craze as well but I didn't really fancy it. 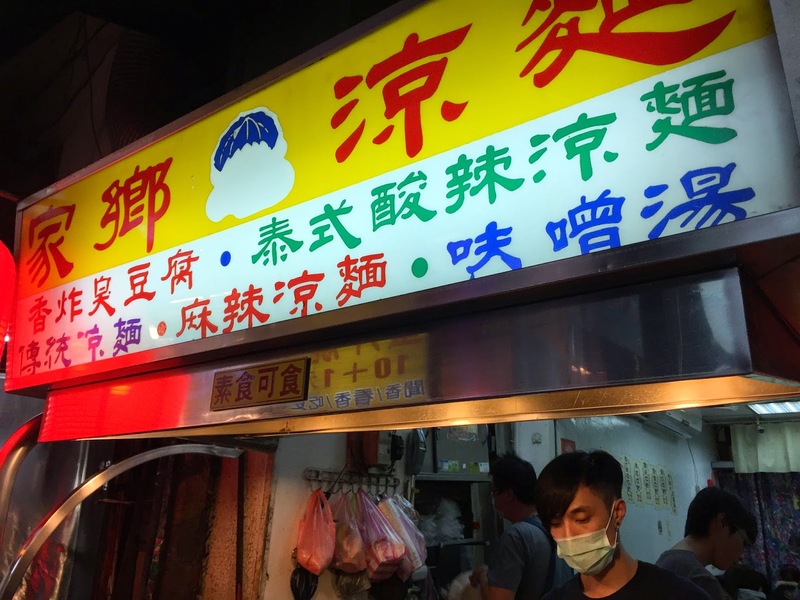 I also heard that you could find tastier ones at either Fengjia night market. But it's still worth a try since we saw many locals were queuing up for it. Costs: 50 to 69 Taiwan dollars. 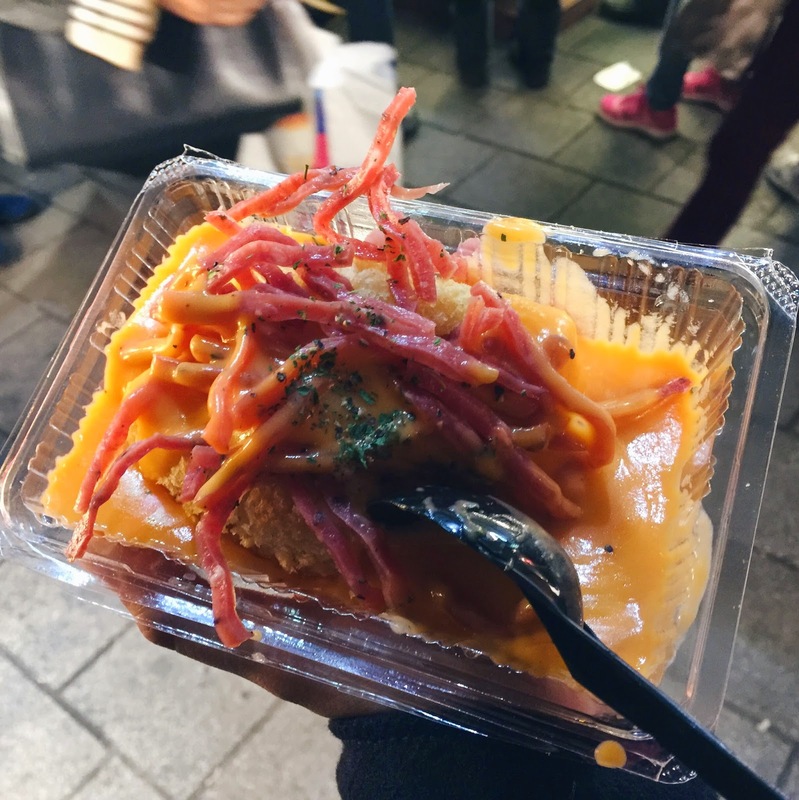 The item that saved our trip to Shilin night market was baked potato served with a generous amount of bacon and cheese sauce. 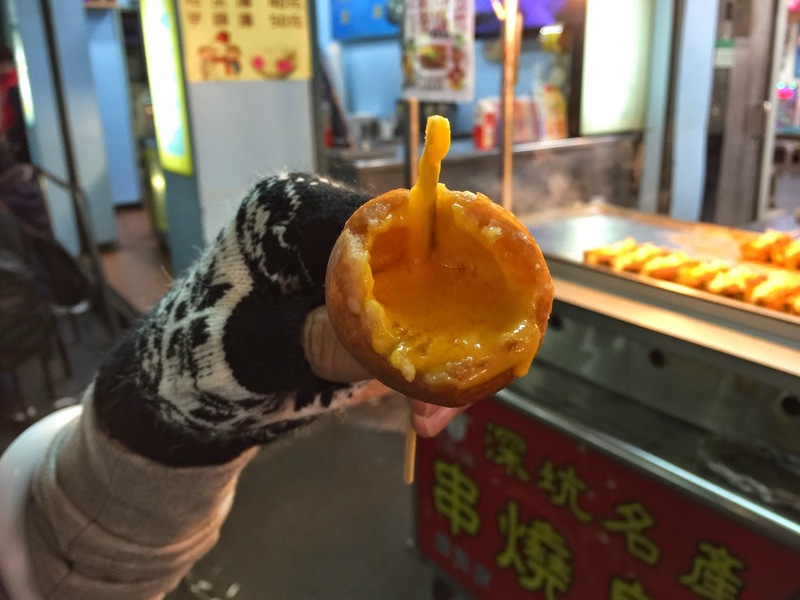 Thinking about it, I can actually try to recreate this snack at home but it just tasted and felt so good to eat it in Taiwan's chilly weather. I tried it again from another store at Fengjia night market but it didn't taste as good as this one. The queue was exceptionally long but just join in anyway because they serve fast, you'll get your baked potato in no more than 4 minutes. Highly recommend this!!! We finally tried STINKY TOUFU!!! It's actually really really good. Don't think of it like the sort you'd find at local pasar malams. These stinky toufus doesn't smell as bad and they're mostly fried. I think they're a bit like durian, they may smell bad but once you eat a piece, you can't stop. I guess it's important to try your first packet from a reputable store and I highly recommend the following. You'll definitely be able to spot it because there will be a really long queue. Costs: 50 Taiwan dollars for small packet. 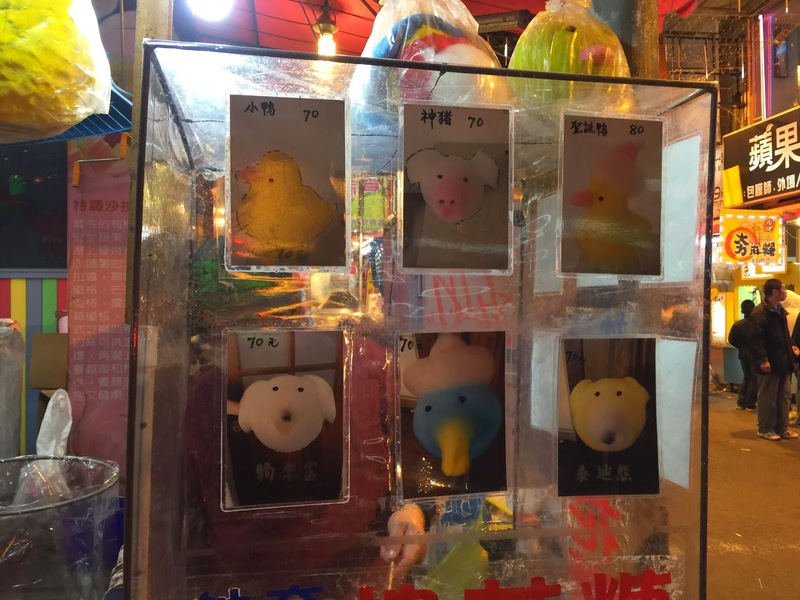 If you're planning on visiting Taiwan, you MUST go to Raohe night market. The next time I fly back to Taiwan, I plan to explore this place twice. It's so good, probably even the highlight of the entire trip. 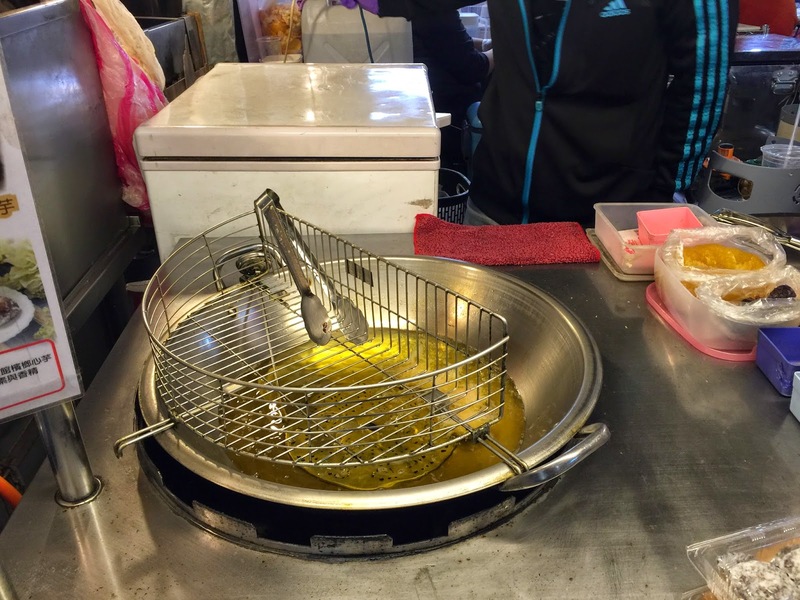 You can find almost any street snack there and they all cost way lesser than those you'd find at Shilin. There is such a huge variety of food to eat, Fai and I stopped at almost every store to buy a snack. I wished we had more time to sit down and dine though. 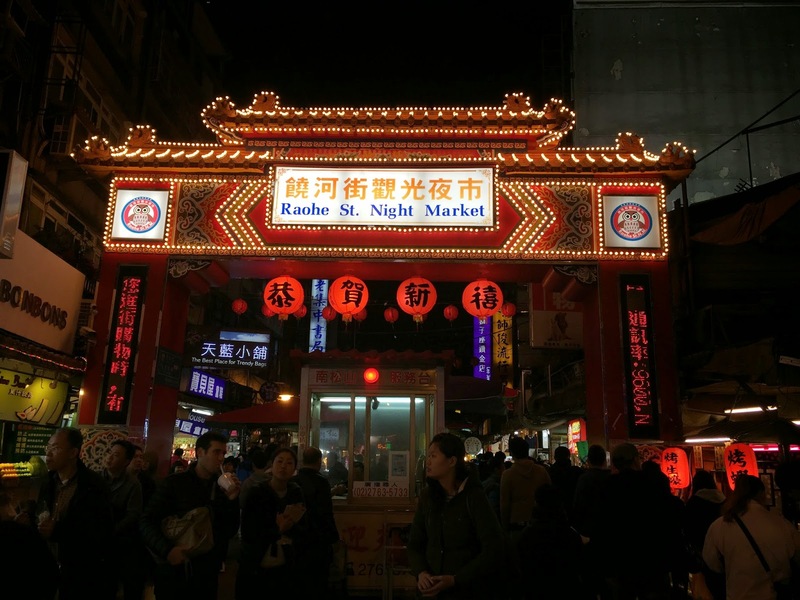 Raohe Night Market is located at Songshan station, probably on the green night. I can't seem to find it on the map, but trust me it is at Songshan. Maybe it's a new station, that's why. It's pretty easy to locate the night market, just look for the following temple. If you love eggs and cheese, you have to try this delicacy! 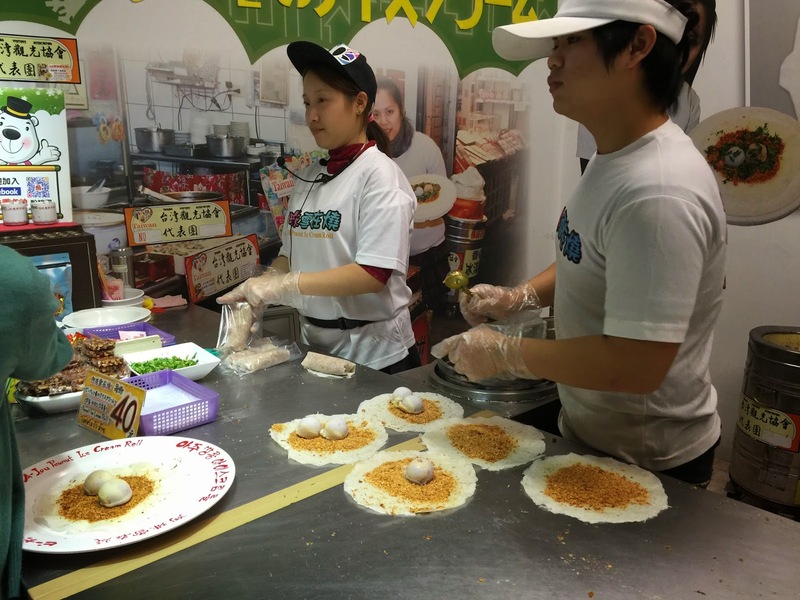 It's quail eggs cooked Takoyaki style! I guess there are quite a huge variety of flavours to choose from but I couldn't understand the menu so I went for the classic prawn filling with cheese sauce topping. They're extremely delicious and the best snack I had in Taiwan. Costs: Once again, can't remember. Was too excited! 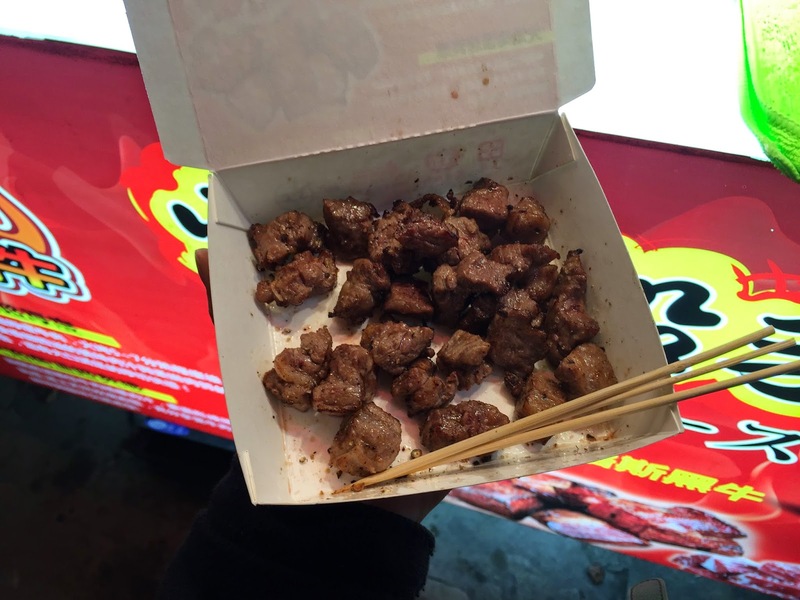 Next, we tried blow torched beef cubes! 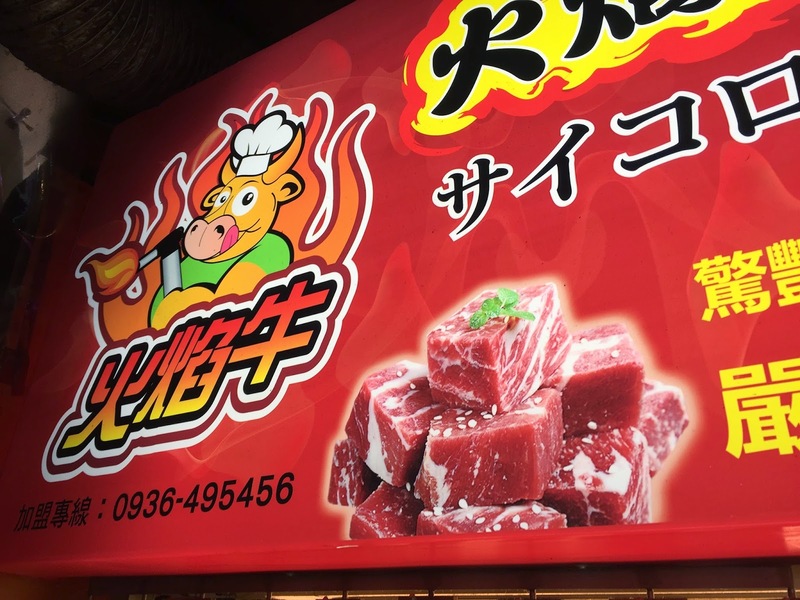 You'll see this sort of store almost EVERYWHERE in Taiwan and they sell nothing but beef cubes. They tasted great, the meat was tender and juicy but there's nothing really special about it. I mean, it tasted just like steak. So I suggest not getting it unless you're really craving for beef. hahaha. And they're so expensive too! Costs: 100 Taiwan dollars per packet. Another must try item is Mango Ice Shaved dessert from THIS PLACE. hahaha. It links to the shop's Facebook page and it's all in Chinese so it'll be pretty tough to find the store if you can't read in Chinese like me. hahaha. But don't worry! Just take down the store's name and ask locals around for direction. The locals are super gracious people; they're help you for sure! The shaved ice didn't feel or taste like ice at all. It was so smooth; it felt more like ice cream. It was crazy eating this when the weather was already so cold but we couldn't help it, it was too good to resist. 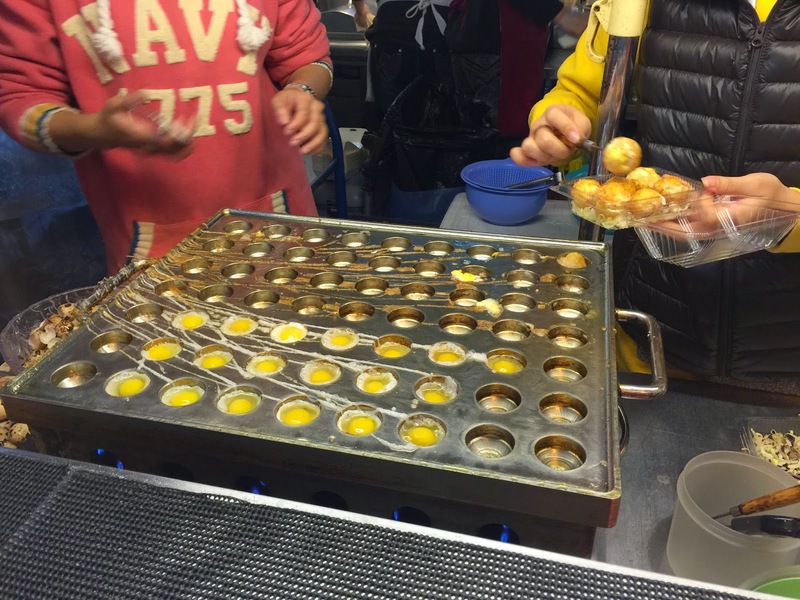 They're basically perfectly round fried balls filled with egg yolk and custard. There are a lot of other flavours as well but we went with the classic. MUST TRY item. Costs: Can't remember. I almost can't remember how much everything cost at Raohe. They were all too good to even care about money. 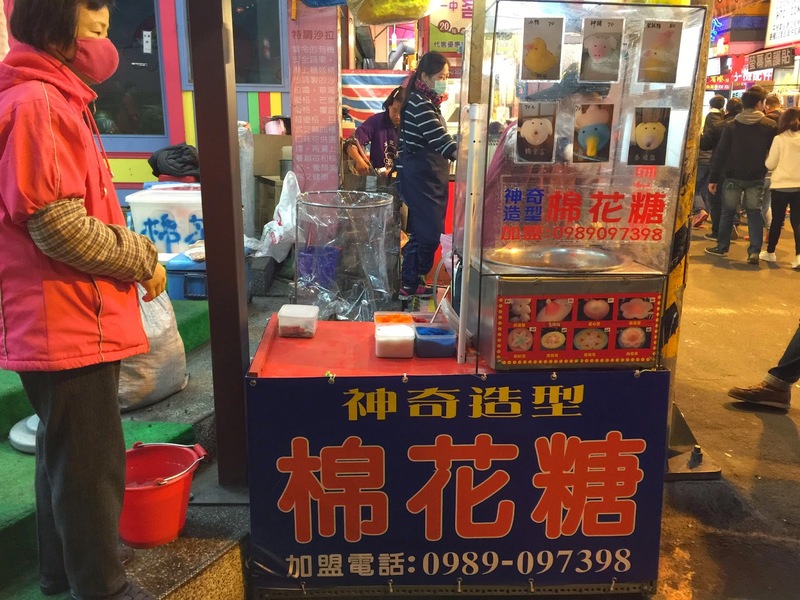 Costs: About 50 Taiwan dollars per bun. Shifen Old Street is quite a distance away from main Taipei area but it's worth visiting if you're into nature. More on that in my next post! Let's just focus on the food now shall we? hehehe. 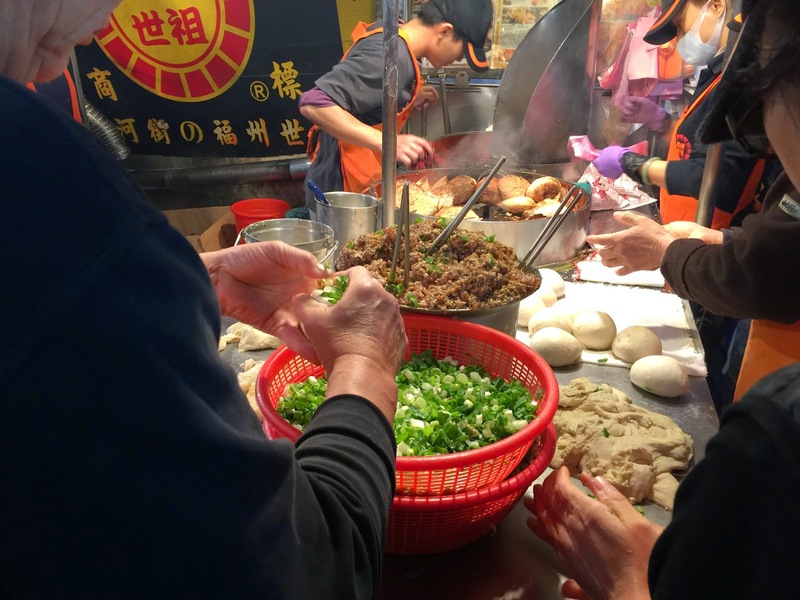 As its name suggests, it's an old street so expect food that are a lot more traditional. 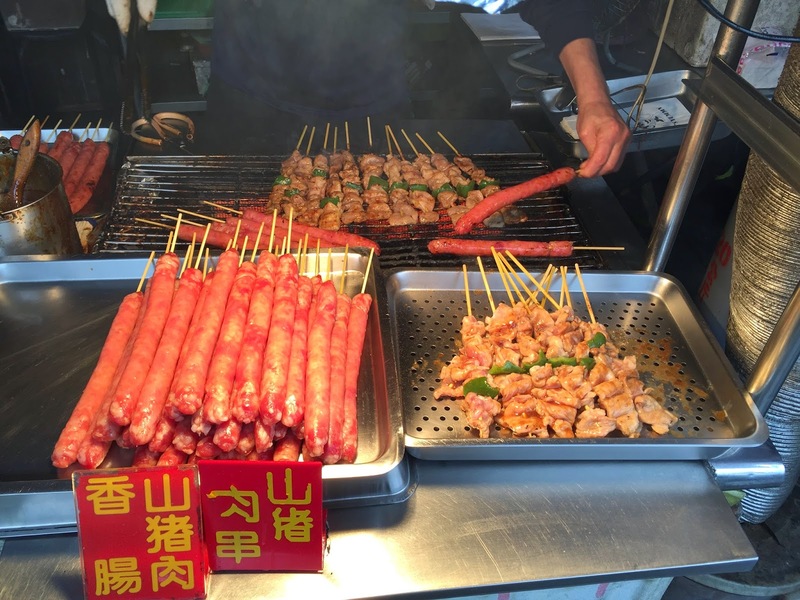 You can find an abundance of stores selling classic Taiwanese sausages, chicken on sticks or even, meatball soups etc. There isn’t a lot of variety to be honest so make sure you've already had your tummies filled before visiting this place. Shifen is located at Shifen RAILWAY station. Not one of the usual metro stations. It's an old street so the only way up is by an OLD railway train. So here's a breakdown on how to get there. You can either purchase a local ticket or an express ticket. We picked local initially because we didn't know that they offered express tickets. So our total travelling time from Ximen station to Shifen Old Street took about 1.5 hours to 2 hours. I recommend you guys to just pay for express tickets. The journey was quite torturous especially if you can't get a seat in time. An express train guarantees you a comfy seat; you can even lie back and take a nap. Shifen Old Street isn't hard to find at all. The moment you get off the train, you're already there! 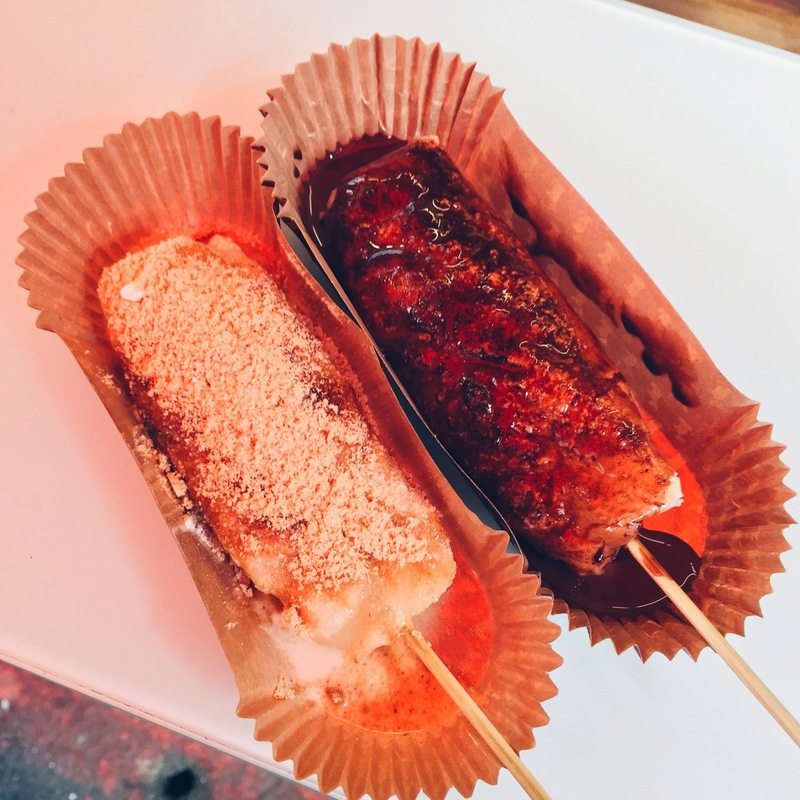 You have to try the Taiwanese sausages and chicken on sticks from the first store at Shifen Old Street. I'm not a huge fan of either of these snacks but I fell in LOVE when I ate them. They're so flavourful and tender, I came back to buy more after. Costs: Can't remember. I'm sorry! Jiufen Old Street aka the Santorini of Taiwan is located at Ruifang station. I can't say much about it because it was raining cats and dogs when we got there. Hence, we didn't get to see or do much :( Most of our time was spent sheltering us from the rain. The entire iconic view of Jiufen, which was apparently known to be scenic, was covered in fog. So if you're planning to include this destination into your itinerary, make sure you check the weather forecast beforehand. 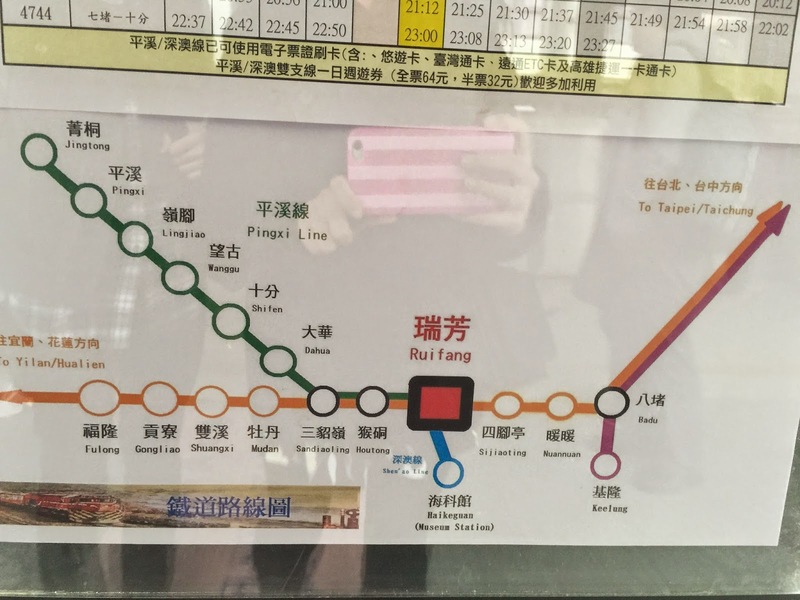 As mentioned earlier, Jiufen Old Street is located at Ruifang station. Since it was raining heavily, I didn't manage to take as many pictures. 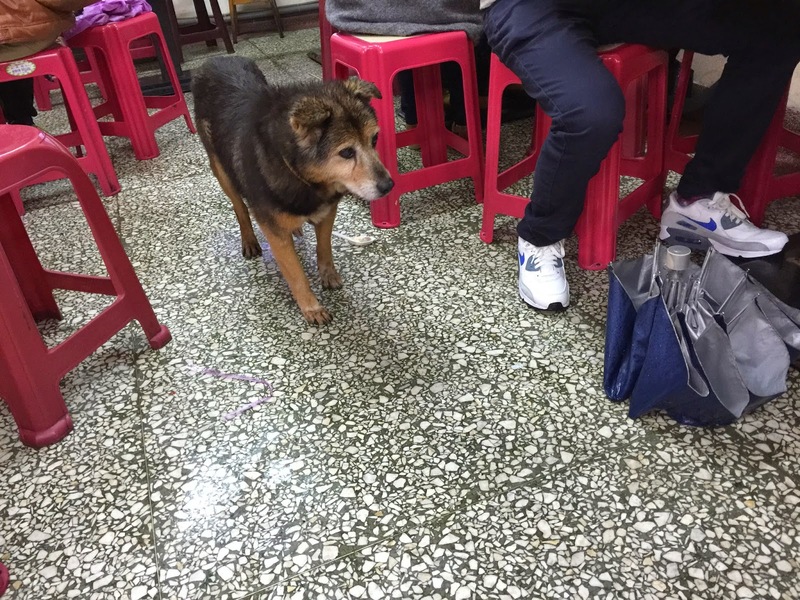 We took shelter in the first noodle shop we saw and tried their beef noodle and fish ball noodle soup with mee. 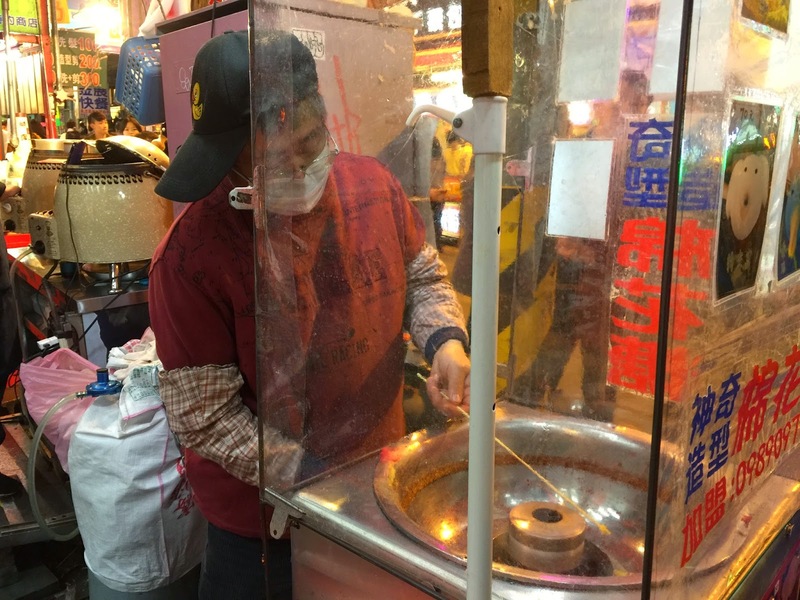 If you ever visit Juifen Old Street, you MUST MUST MUST try their fish noodles! 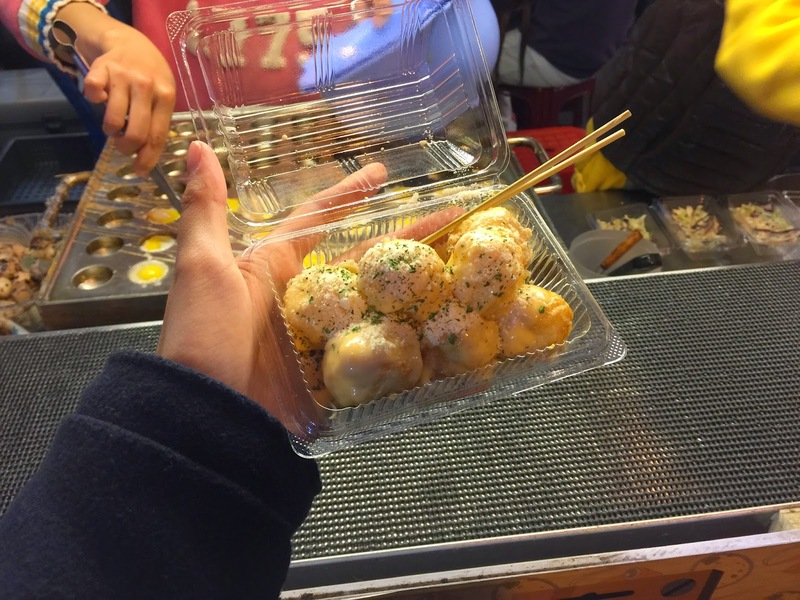 Their fish balls were heavenly. They are handmade, so they're a lot more savoury and tasty. The beef is just as delicious and tender. 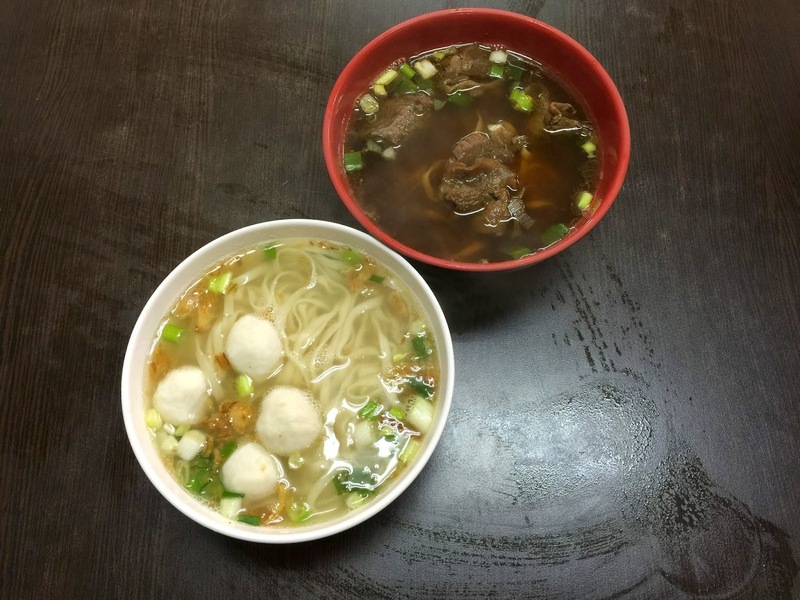 Costs: 100 Taiwan dollars for beef noodles, 50 taiwan dollars for fish ball noodles. 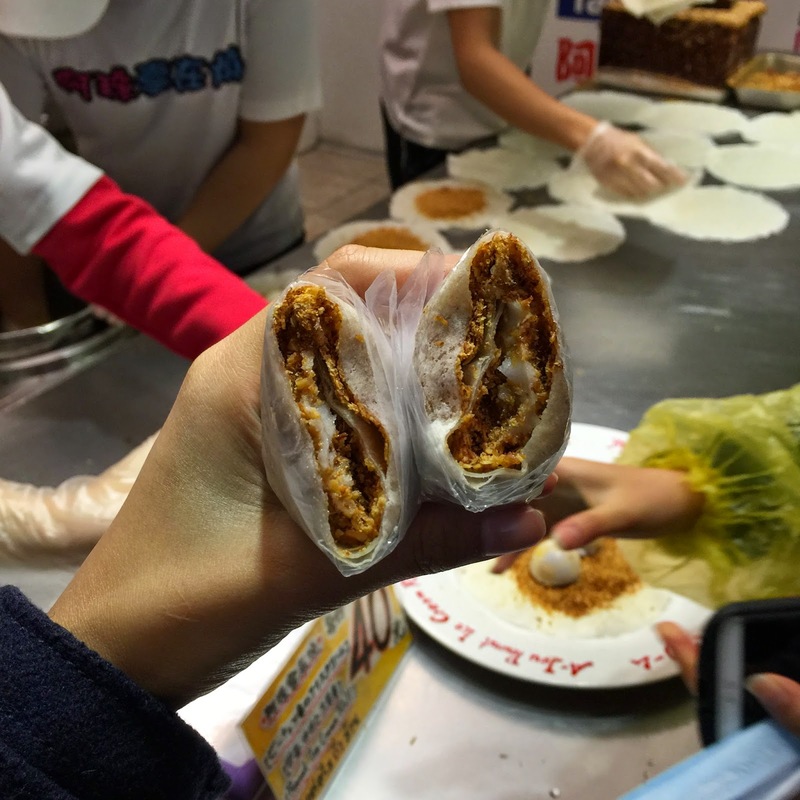 Jiufen Old Street was where I tried Taiwan's famous Peanut Ice Cream Popiah snack. Sure, it was 13 degrees celsius that week but it didn't stop me from getting ice cream. hehehe. I am in LOVE with this street snack! The ingredients are simple and rather straightforward but there's just something special about the combination of flavours. I think a large part of it is due to the unique shaved peanut flakes. You might think that they simply added typical grounded peanuts, but you're wrong! They manually shaved off flakes of peanut from a large block! Check it out below. Highly recommend you guys to try this out! 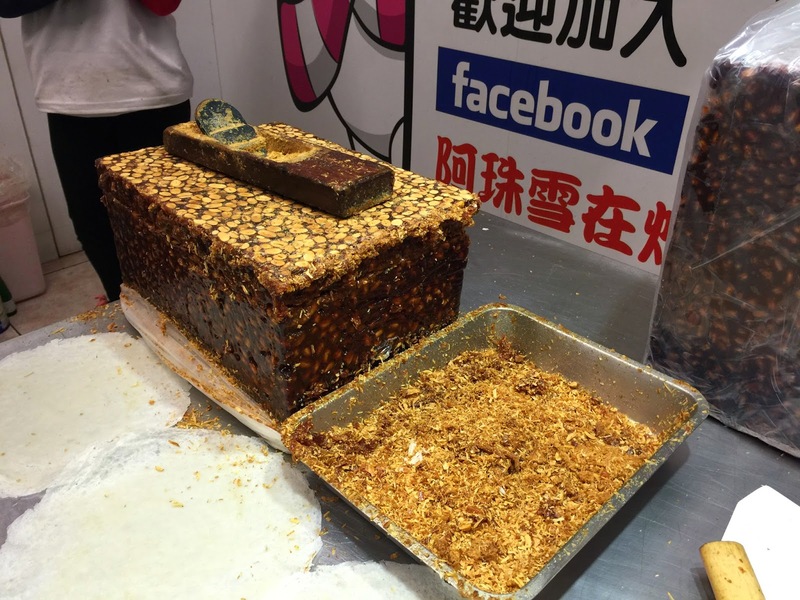 Also, I can't seem to find it at the other night markets :( I found a store selling it at Ximending but it didn't taste as good. Fai and I visited Taichung, another part of Taiwan on the third day. We went up to Xinshe and visited its castle - a popular tourist spot. There is NOTHING to eat there to be honest. If you followed me on Snapchat, you'd have seen how unsatisfied I was with our meal that cost over SGD$20 each! I recommend you to have your breakfast or lunch first before making your way to Xinshe castle. Xinshe castle is located in Taichung (not Taipei). 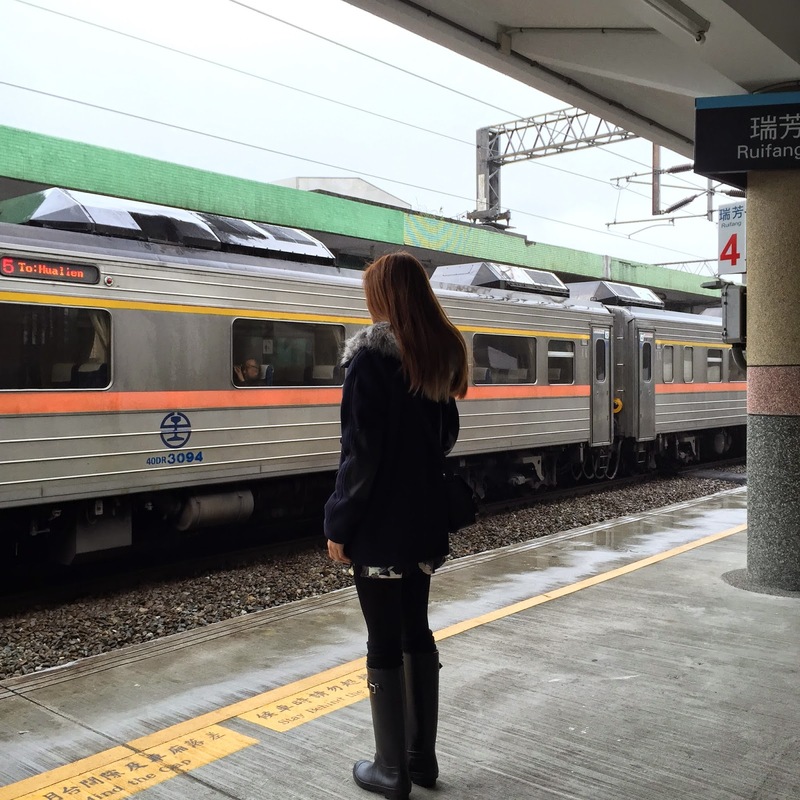 The only way there is by Taiwan's High Speed Rail. If I'm not wrong, it travels through 5 different states at a speed of about 300km/h. It's extremely fast but there's nothing to worry about! You won't feel the speed except that things outside go past you really quick! Tickets are pretty expensive (about 800 to 1000 Taiwan dollars per person) but totally worth it. The journey to Taichung station took about an hour. You can spend your time taking a nap or even eat. Yes, you can eat on their trains. 2) Board High Speed Rail (HSR) train to Taichung station. 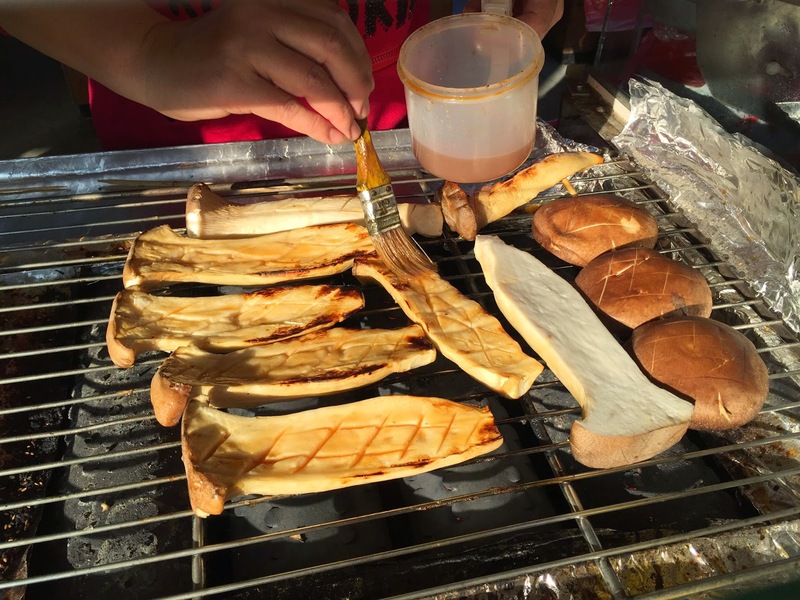 Along the way, our cab driver treated us to traditional grilled mushrooms. I have no idea what they were called but we ate them anyway! They were so succulent and had a unique tang to its taste, so it's another must try snack! Cost: I don't know. Our cab driver paid for them! So sweet of him right! Our cab driver's contact number. Call him at 0910-420740 and request for his service! Very gracious and kind hearted man :) He goes by the name Mr Cheng. 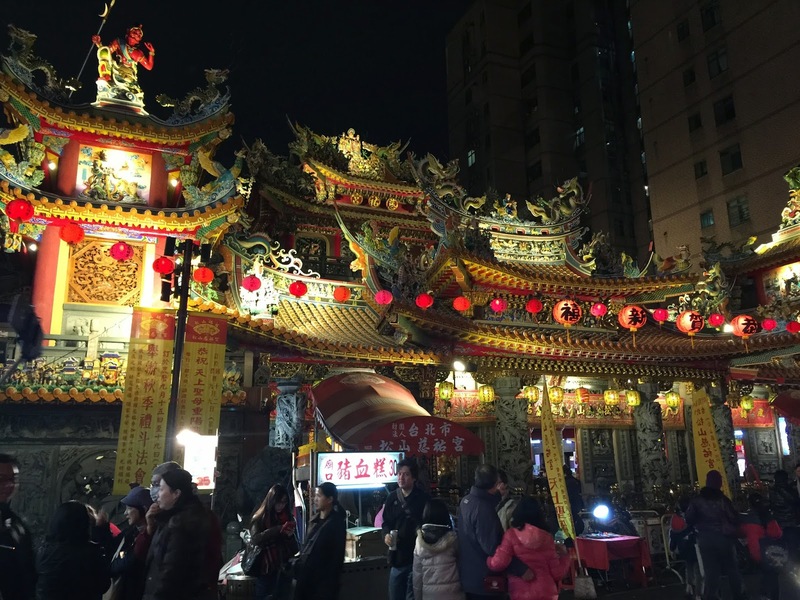 Fengjia Night Market is located in Taichung. We got there by cab from Xinshe castle so I'm not sure if any bus will get you there from Taichung station. I suggest you take a cab anyway, it's freezing in Taichung. I get an average of 11 comments on my OOTD photo or a selfie. But I received over 140 comments on a picture of a duck made out of cotton candy on my Instagram. Why wouldn't it? It's one of the cutest, most inventive things I've ever seen. Who would have thought that one could create art out of cotton candy right? We walked the entire night market and found this humble little stall at the end of it. 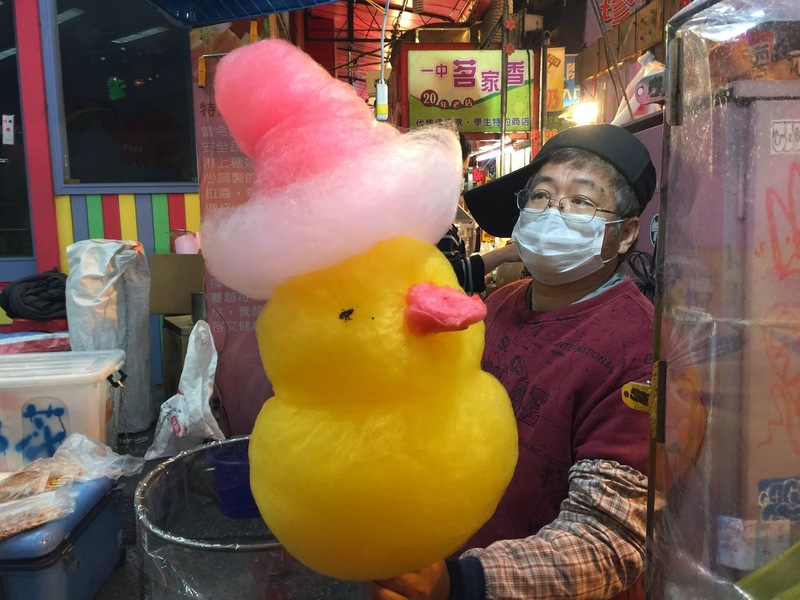 The vendor uncle could make several animal or flower figures out of cotton candy. It was so fun to just watch. In the end, I bought a ginormous duck cotton candy for myself! hehehehe. Costs: 60 to 80 Taiwan dollars depending on design. 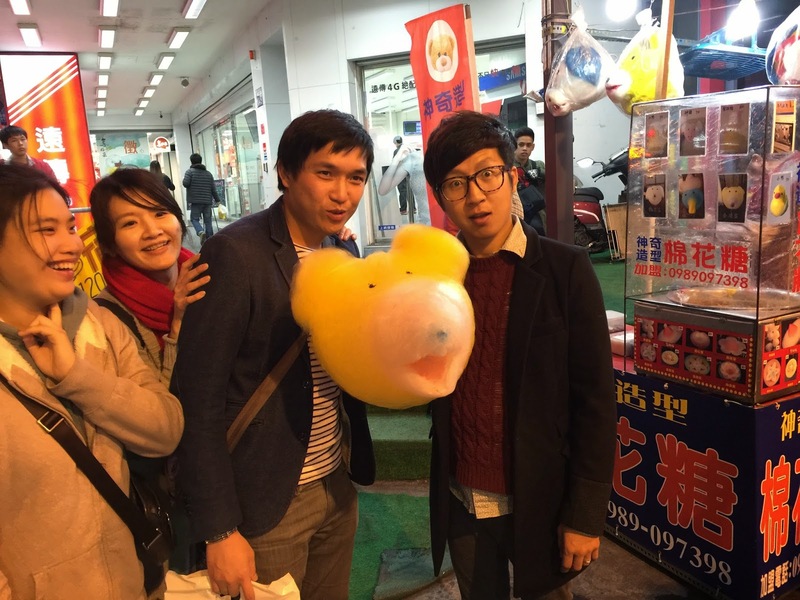 Back in Taipei, we travelled to one last night market called Shida. Well, it was more like a food street than a night market. 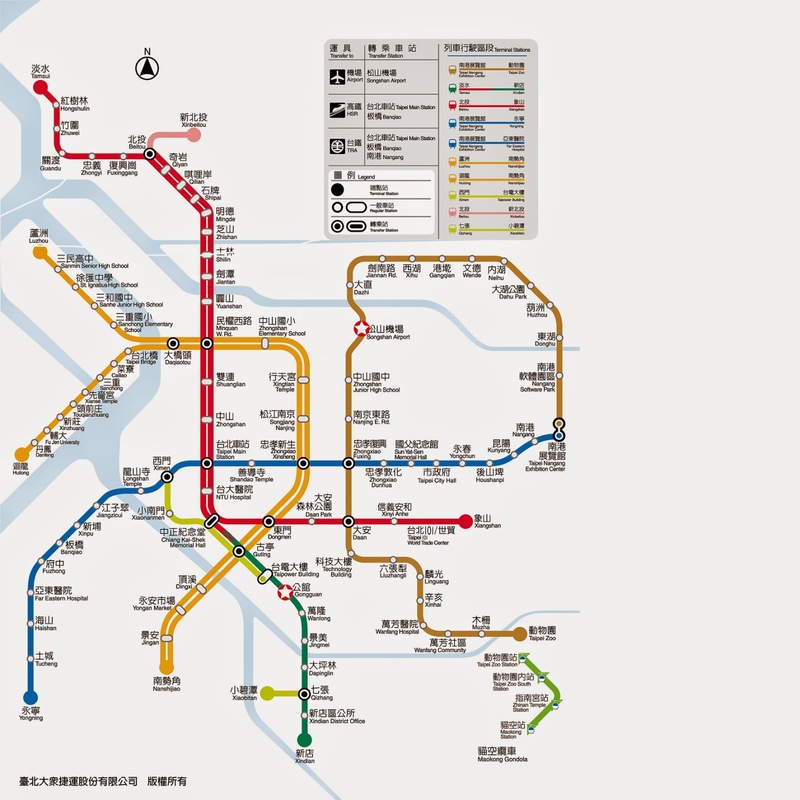 I recommend you guys to check out Gongguang shopping district and Shida Night Market on the same day since they're pretty close on the metro map. 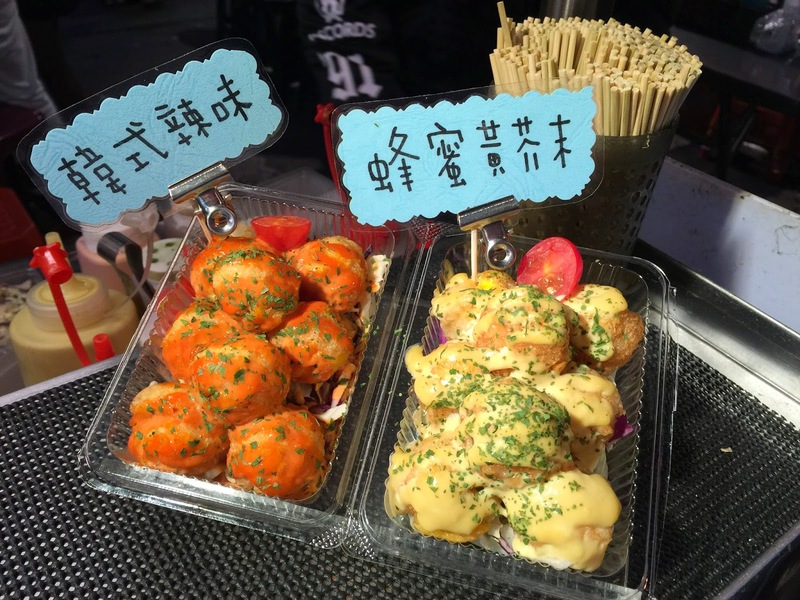 Though Shida was much smaller than most night markets, it offered quite an extensive array of food that you wouldn't be able to find so easily at other night markets. We bought about 3 different snacks during our time there and I loved all 3 of them! 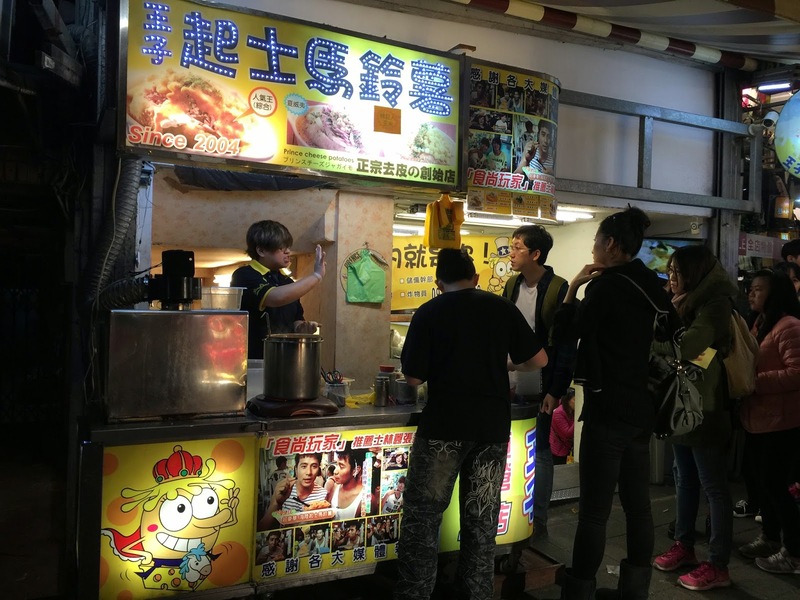 Shida Night Market or food street is located at Taipower Building station, on the green line. We didn't know where to really start and by this day, Fai and I were already pretty exhausted and less excited about things. So we just queued where ever there was a long line without even giving much thought about what we were about to buy. hahaha. It was quite a good move though because we ended up getting ourselves some really delicious warm onion pancakes. YOU HAVE TO TRY THIS MAN. It's one of a kind and I don't even like onions to begin with but I am in love with this snack. In fact, I'm craving for it right now! The line is crazily long but trust me; it's worth the wait. Don't forget to add the sauces and chilli! There's quite a wide variety of fillings to choose but I ordered peanut because I couldn't read what the other flavours were :( I think they also offered red bean, milk and more! Costs: About 20 to 30 per piece. Whoohoo!! 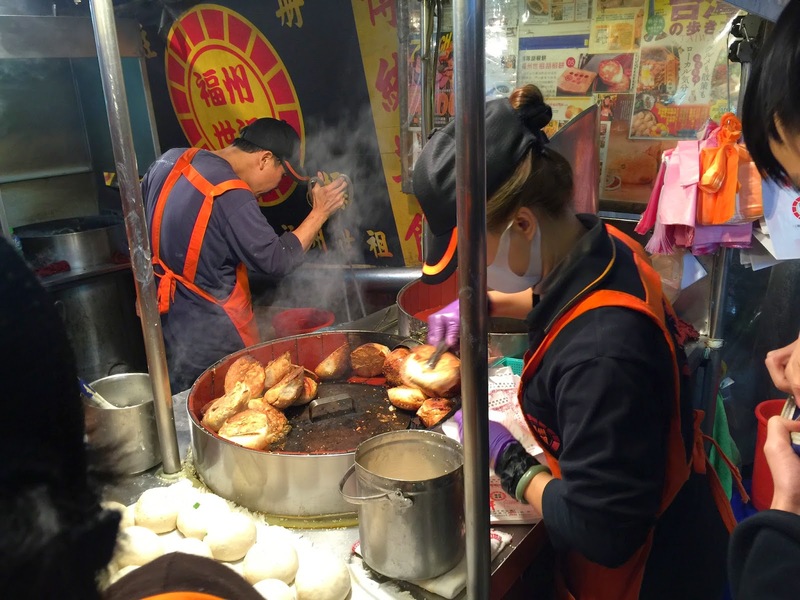 We've finally come to the end of my "What to EAT in Taiwan" post. It was so painful to write it because all of the food pictures kept making me feel hungry. You have no idea how many times I ran out to my kitchen just to find an alternative to the snacks featured here. hahaha. Anyway, just so you know, I left out a lot of other snacks and delicacies such as grilled oysters or braised pork with rice. So make sure you try them out too all right? I'm sure they'll taste great, I just couldn't find them in time or I didn't want to try them altogether. hehehe. P.S. On a side note, let us all pray for the victims and their families of the latest TransAsia Flight GE235 crash incident. May the survivors recovery from the traumatic experience and may the souls of the lost lives rest in peace. 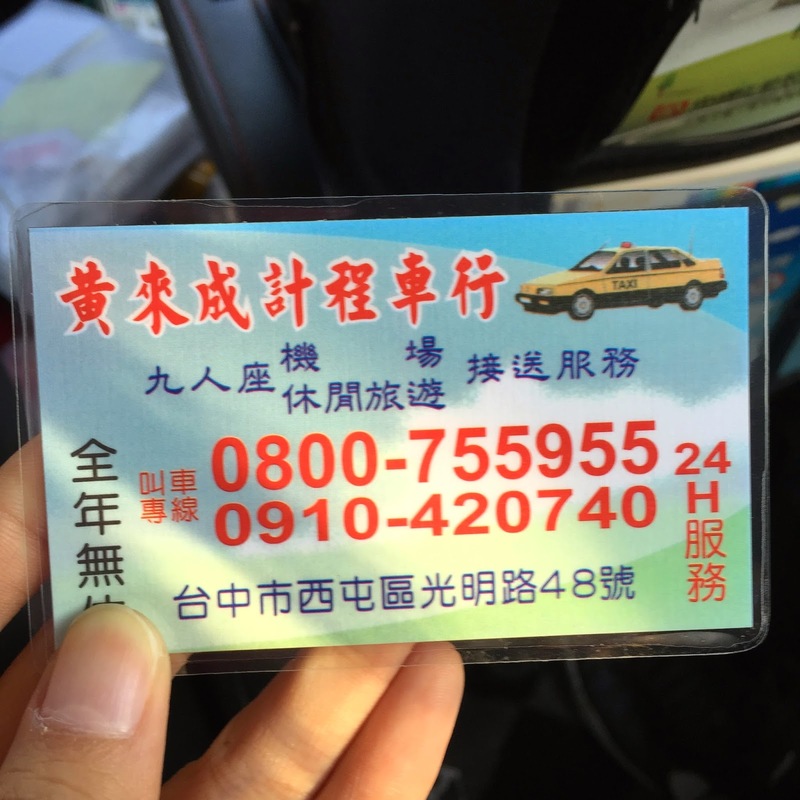 Is the taxi driver, Mr Cheng, based in Taichung? Does he understand English? 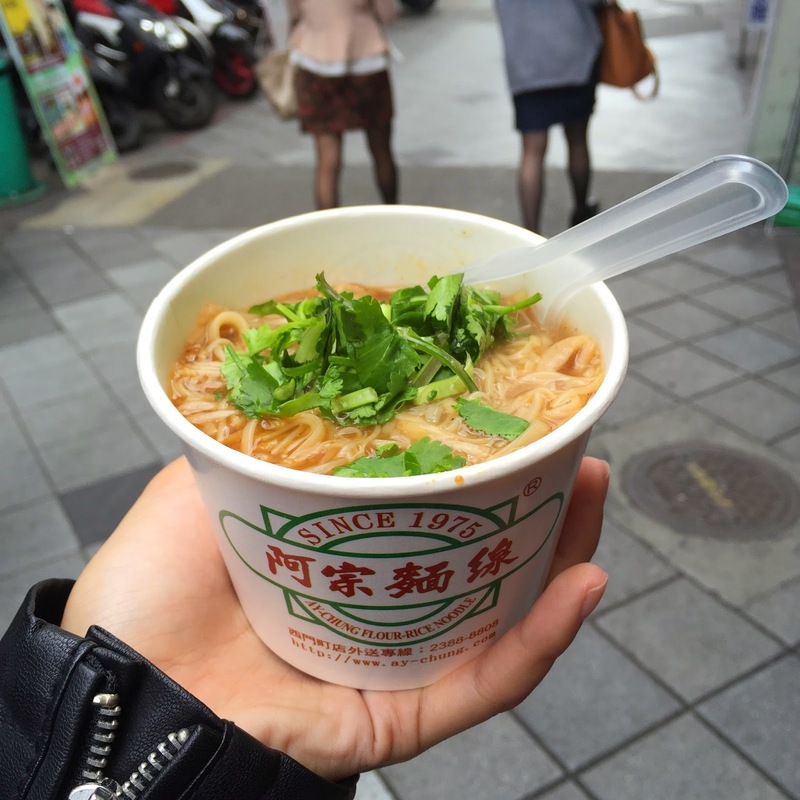 I'll be planning a trip to Taiwan soon and this post is SO helpful! Saves the lazy me a lot of time on travel research. 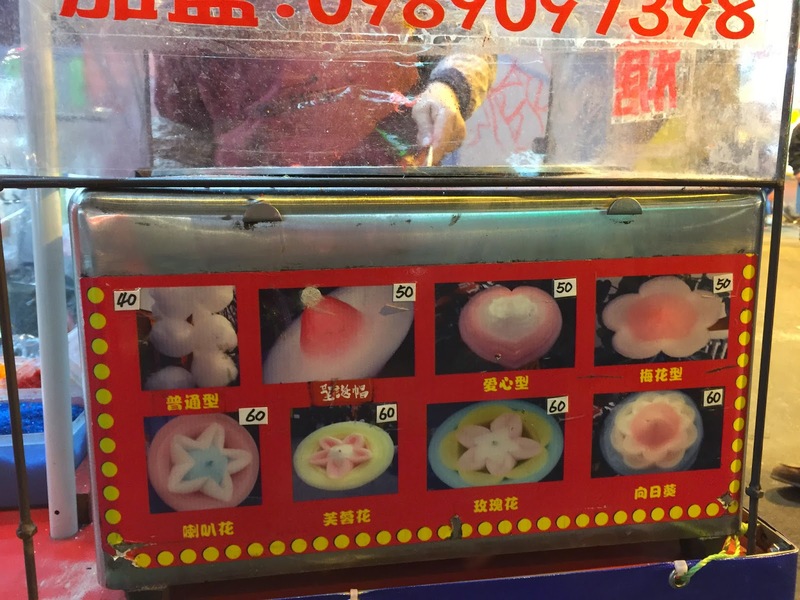 =P Taichung will probably be one of my stops just for that adorable cotton candy too! Looking forward to the rest of your travel posts. Seems that you had a blast! don't mind sharing where you got your boots that you wore to Taipei? the last one isn't shida night market! It's actually Gongguan night market. I think you alighted one stop after Taipower Station which is why you ended up at the wrong nightmarket! Hi Eunice, is there a particular exit that we should take from the mrt station to go to the ximending market where the muah chee is? also, do they have days when they close? or opening and closing hours? Thanks for writing. Stand alone dental discount plans NC are very useful offered by Dentalsave. After becoming a member, one has to pay an annual or monthly membership fee which is cheaper than typical insurance premium and get saving in any dental care procedure.